My formative years at Sheffield college instilled the passion I have for food to this very day, having completed my qualifications NVQ levels 1 and 2 and advance level in Pastry I left Sheffield and spent the next 5 years working at The Oriental Club London. This was a great opportunity to experience different techniques, styles and flavours of national and international cuisine. Whilst working there I won the prestigious CSMA Chef of the year tournament at Olympia. From here I spent a year working and traveling through Australia. There I started working for a small company operating out of The Sydney Opera House. As an events catering company I had my first real introduction into mass catering. We catered for the needs of small intimate parties on boats and in their homes to huge Movie premiers like The Matrix, Master and Commander to name but a few. From here I travelled to the northern tip of Australia working on some of the islands on the barrier reef. Returning back to the UK and Home, I have worked in some of the best restaurants in Sheffield firstly The Wortley Arms under Chef proprietor Andy Gabbitas a renowned caterer in the city and Rafters Restaurant which has won Yorkshire restaurant of the year and has continually been recommended in the Michelin Guide for the last 3 years. For the best part of 25 years I have spent trying to improve my skills and am always in search of perfection. Food styles and techniques are always evolving and that's what makes me love this industry the hours and dedication are demanding but the rewards are so much more. Finally, the date has been set for The Shef's Table first Pop Up and we've changed the menu from exploring the Deep South to that of the Orient. Each month we will be exploring exciting new cuisines with our own unique twist. We bring you amazing food, passionate chefs, and a merry get-together to see old friends, meet new ones, and share a lovely experience! 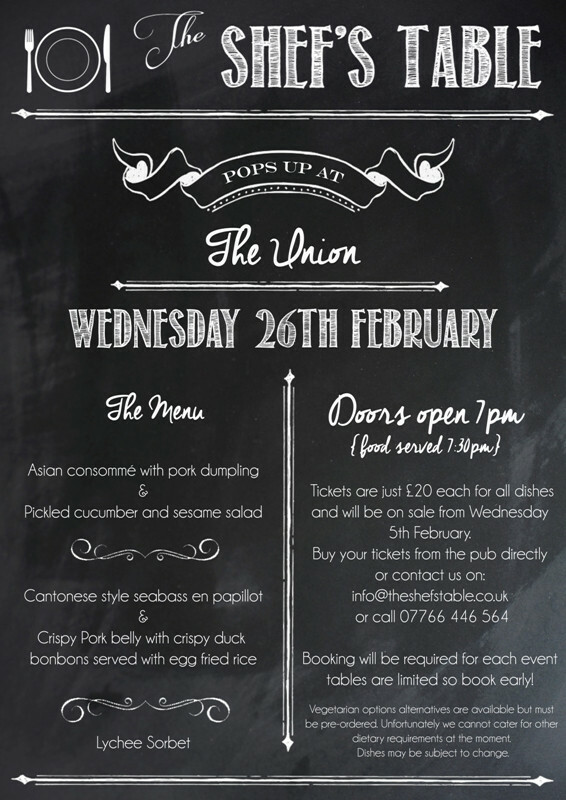 Join us on the 26th February as we explore the taste of the Orient in our Pan-Asian Pop Up. The event starts at 19:00 with dishes served at 19:30. Tickets are only £20 each for all dishes. The venue will be at the Union Pub in Nether Edge and tickets will be on sale from Wednesday 5th February. Buy your tickets from the bar directly or contact us on info@theshefstable.co.uk or call 07766 446 564. Vegetarian options alternatives are available but must be pre informed. Unfortunately we cannot cater for other dietary requirements at the moment. Dishes may be subject to change. Booking will be required for each event and tables are limited so we encourage diners to book early! First taster as The Shef's Table last night for a wedding in April. Bride and groom to be seemed extremely happy with everything and The Shef's Table experience was a success. The idea of The Shef's Table is less to do with a pun on the word Sheffield but more to do with the personal, unique and bespoke experiences we want to achieve.